The event was organised by pastor Terry Jones in January 2013. It was uploaded to Youtube and the entire 54 minutes long thing can be viewed. The burning starts at the 51:50 mark. In the event they burn the effigies of Obama and Bill Clinton. The sign was put up by Thomas Savka on his property in Wisconsin. According to both the Huffington Post and International Business Times Savka claimed that the sign was pro Obama. Both of them citing and linking to defunct reports by local affiliates of NBC and FOX. Savka told the WGBA that the message is aimed at propping up Obama during the last weeks of the campaign. The message is “never give up. Don’t quit. I don’t care about the noose around your neck, I don’t care if you’re hanging,” Savka said. A man who posted a sign with the words “hang” and “Obama” along with a noose on a Wisconsin highway insists the shocking poster is in support of President Barack Obama. The yellow sign featured red letters with the words “Hang” and “Obama” with smaller blue text reading “In There” in between the larger words. To the left is a noose. "It's my attitude for it. Everybody's picking on Obama. It's the attitude of 'hang in there, buddy!' It isn't over ‘til you're done kicking,” Thomas Savka of Redgranite, Wis., told Fox 11 Online, which has a photo of the sign on its [website]. Others aren’t buying Savka’s explanation, including the Obama campaign. “This type of imagery is inappropriate, and has no place in public discourse around elections,” an Obama campaign spokesman told Fox 11. 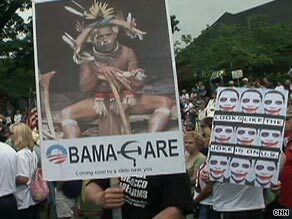 Posters portraying President Obama as a witch doctor may be racist, organizers of Tea Party protests say, but they reflect anger about where he is leading the country. The posters, showing Obama wearing a feather headdress and a bone through his nose, have been popping up in e-mails, on Web sites and at Tea Party protests for weeks. As well as this video showing a news reporter interviewing a shop owner who put the poster on his display. 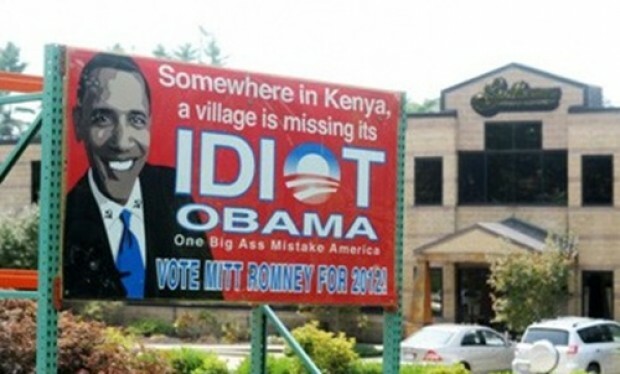 A Daily Mail article about three anti Obama billboards put on display outside a motorbike accessories store off Route 27 in Hanson, Massachusetts, one of them saying "Somewhere in Kenya, a village is missing its idiot" with a picture of Obama. Another one of the politically-charged posters, supporting Republican candidate Romney, shows a smiling President with communist hammer and sickle symbols added to his shirt collar. The Daily Beast credit the picture to Justin Sullivan at Getty Images. Regardless of the authenticity of that specific picture, it talks about the Barak Obama birth certificate conspiracy. Were lawn jockey statues used to indicate stops on the Underground Railroad?